Tonight, the City Council of Nanaimo is holding a special meeting to hear from residents, about the proposal before them, by Island Ferry Service Ltd of Victoria. 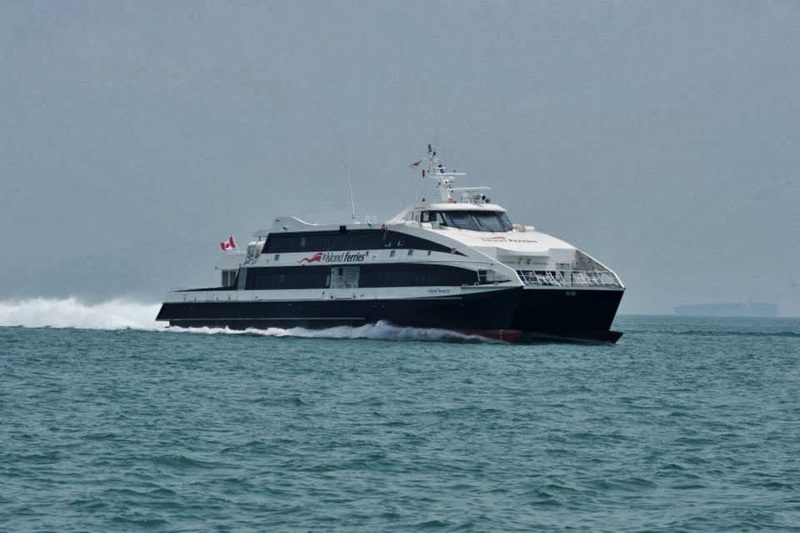 They are seeking approval, and some concessions, from the city in a bid to bring back foot passenger ferry between the Harbour City and Vancouver. In the past, several ventures have failed at this, for various reasons, the most recent was the Harbour Lynx. The one ship operation failed after the vessel blew one of its engine, restriciting its operation, and draining its operating capital. What it did not fail for, was a lack of demand. Vancouver has one of the most difficult work commute of any city in North America, with commuters spending more than three hours a day on their trek to work or play, with this in mind, it easy to see how a 68 minutes ferry ride, from the more affordable housing market of Nanaimo, is a feasible option for a commuter, and an attractive partner for the city. 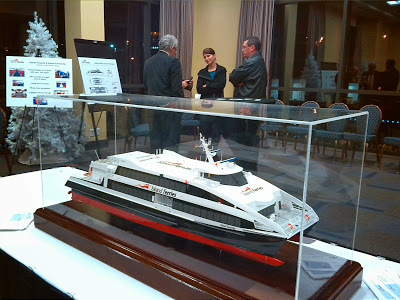 Island Ferries had an open house last Monday at the Nanaimo Convention Center, introducing their plans to the community at large. Island Ferries staff mingled with visitors answering their questions. I spoke with the Director of Marine Operations, David Marshall, who mentioned that the biggest misconception about their plan was that Island Ferries was seeking tax breaks for the venture. He explains that the private company is actually looking for a temporary deferral of their profit sharing plan with the city, and not tax breaks, while the service gets going. I am certainly in support of the efforts, it is a fresh service that is needed and wanted, that will provide employment for local seafarers. The company plans to hire about 100 employees, with about 85 staff out of Nanaimo. The vessels will be powered by 4 MTU2000 series engines, and they anticipate running with one engineer on each vessel. I would estimate a technical / engineering staff of about 8 or 10, based out of Nanaimo. Other aspect that struck me, as a member of the community, was that the operational plan consist of using the city’s property and water lease next to the Port of Nanaimo’s facilities, which host the new cruise ship dock. 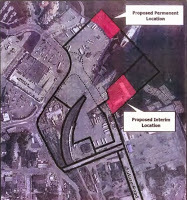 The long term plan would see the city put in a road along to the waterfront, serving the Port of Nanaimo and the passenger ferry terminal, however this area is currently Seaspan‘s marshaling area for their train and drop trailer ferry service, which is also on City of Nanaimo land. “Gentrifying” this industrial area in the heart of downtown, would certainly bode well for tourist and general beautification of the city. I would imagine that with Seaspan’s acquisition of Sea Links operations last year, that they will amalgamate their operation to the Port of Nanaimo facility at Duke Point, a more apt area for this type of operation. This assumption would mean that Seaspan would probably not build the train ramp system they currently used in downtown Nanaimo, over at Duke point. I theorize that the current train car capable vessels, Seaspan Greg, the Carrier Princess, Princess Superior (Seaspan Dori is now retired – I believe) would probably end up being retired fairly quickly, and a simple tug and barge system would be used, matching what both Sealink and Seaspan have been utilizing these past years. Ultimately, it is the aim of Island Ferries to move into part of Seaspan’s existing location, next to BC Ferries’ Gabriola terminal, and pretty much right in the heart of downtwon Nanaimo. 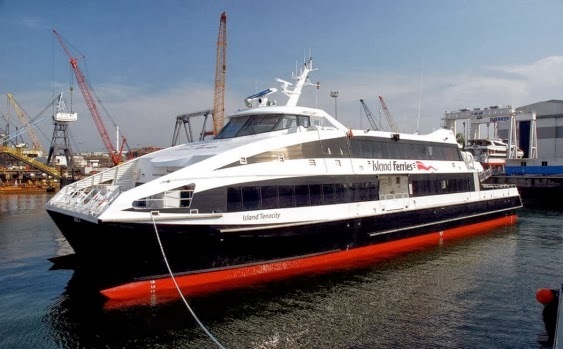 The service proposes to use two brand new Damen designed, and built, fast ferries. The service would take passengers from the terminal in downtown Nanaimo, to the Seabus terminal, a major transit hub, in downtown Vancouver – a very convenient spot for commuters and visitors alike. The Island Tenacity, and the Island Friendship, are new vessels and appear to be all ready to go, and currently located at the builder’s yard in Singapore, painted in Island Ferries livery. 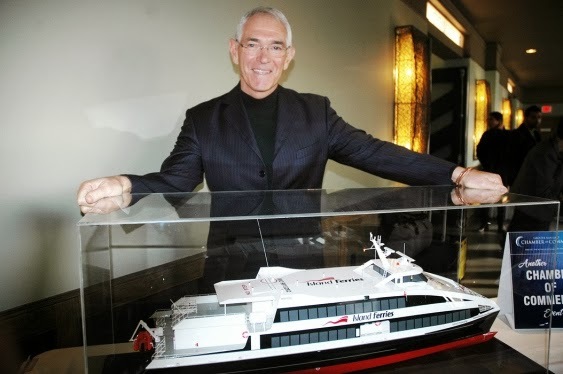 The vessels are a Damen Fast Ferry model 4212, made of aluminum. Each vessel will carry 376 passenger on two decks. They are wheelchair friendly, have bike and luggage storage, along with limited food service. The service is expected to operate six round trip sailings during the summer, four during the winter, with both vessels based out of Nanaimo. The cost is expected to be CAD$31 for a regular fare. You can find out more information from their Facebook page. There is more information on the dealings with stakeholders from local newspapers, here, here, and here; more pictures and story at BC Shipping News. I encourage you to participate in the Town Hall meeting organized by the City of Nanaimo, and happening tonight, (Monday Dec 2, 2013, at the Shaw Auditorium of the Nanaimo Convention Center), and show your support for a great vision, and investment (pegged at CAD$63 mill), by Island Ferries for our community.